The Dura-Trel Heavy Duty Feeder Post & Hanger complements every backyard garden or bird habitat with its classic beauty and quality vinyl construction. With one hook placed perfectly on either side of the center post and a place to post mount your bird feeder, your options open up to endless possibilities and help you achieve both bird feeding success and backyard beautification. Mount a bird feeder on the post and hang wild flower baskets on the hooks. Your flower-feeder combination will achieve a whole new level of bird feeding success. The Dura-Trel Heavy Duty Feeder Post & Hanger beautifully displays hopper, platform, and tube feeders as well as hanging plants, outdoor lanterns, and other decorative objects. The hooks are located 8" from the center pole on the 18" hanging arms, making them ideal for any hanging items with up to a 14" diameter. The hanging arms are placed 56.5" from the bottom of the post, putting your hanging items at the ideal height for viewing and maintaining, and an included anchor keeps the unit stable in soil. 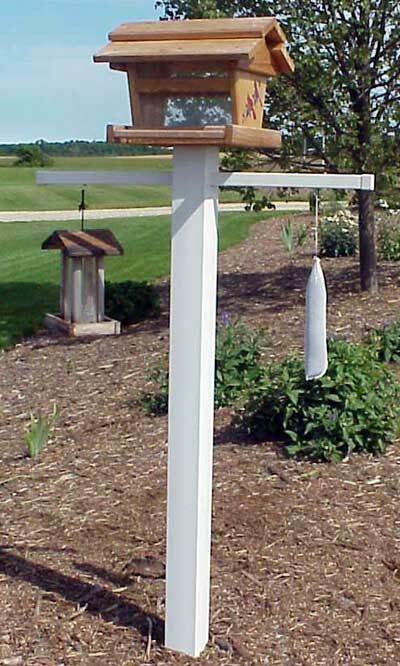 The Heavy Duty Feeder Post & Hanger is a classic addition to any yard or birding sanctuary. Dura-Trel posts are constructed of the highest quality vinyl, which contains the greatest concentration of Titanium Dioxide available. Titanium Dioxide is a powerful UV stabilizer that protects the vinyl from the harmful ultraviolet rays of the sun. This post will never fade, crack, peel, or rot and there is no need to paint it. An included 4" x 4" x 2" mounting block allows you to easily connect a mounting bracket to the item, and hardware is included. Made in the USA. Twenty year guarantee. Note: Bird feeders are not included. Dura-Trel Heavy Duty Hanging Post, White, 7' 7"
Dura-Trel Heavy Duty Deluxe Hanging Post, White, 8' 3"
Dura-Trel Feeder Post, White, 4' 5"